The Camel - camels make very little noise as they walk. here are two or three varieties of the camel, but they do not differ from each other much more than our horses, some of which, the stout and strong, we use to draw heavy loads; others, more slender and graceful, we use for riding. 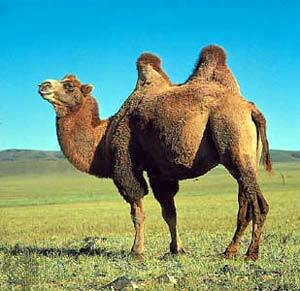 The swift camel is called a Dromedary; it will carry its rider a hundred miles a day. Dromedaries are mentioned in the book of Esther, where messages were to be sent in haste to all parts of a vast kingdom; the messengers rode "on mules, and camels, and young dromedaries." This is a very large animal and is mentioned a great many times in the Bible. I think you will like to find all these places, and see what is said about the camel. It seems as though God made it to live in just such countries as it does, for it can go a great many days without drinking any water; and if it were not for this, it would die of thirst, because the wells and springs are so far apart. If the people of those countries had not the camel they could not travel; so you see how kind God is to them. There is a very beautiful story in the twenty-fourth chapter of Genesis, in which there is something about camels. I will tell you part of it. In the country where it happened a man does not generally choose a wife for himself, but his father or some other friend chooses for him. You have heard about Abraham, and know that he was a good man and a friend of God. When his son Isaac was forty years old, Abraham wished to find a wife for him, but he was not willing to take one from among the people where he lived, because they were very wicked. So he called a good old servant that he had-a gray-headed man-and told him that he wished him to go to a distant country and bring a wife for Isaac from there. Then Eliezer, the servant, took several other servants, and ten of his master's camels, and many presents, and started on his journey. After they had travelled a great many days, they came near to the city where Abraham had told them to go. It was just before night, and that was the time when the young women used to go out of the city to draw water. I have told you that there are not many wells in that country, so that a great many persons draw water at one place. It is the custom for females to go for it, and they usually carry it in pitchers on their heads. Eliezer made his camels lie down by this well, because they had come to the end of their journey and were very tired. But how was he to know who would be a good wife for Isaac, among all the women of this large city? He did not know; but he was a good man, and he prayed to God to choose one for him, and let him know which she was. And he asked God to let him know in this way which I will tell you. When the young women came out to the well, he was going to ask them for some water, and he prayed that the one who answered him kindly, and gave him drink, might be the right one for Isaac's wife. Pretty soon he saw a young woman coming with her pitcher on her head, and she was very fair and handsome; but this alone did not satisfy Eliezer. He waited till she had drawn some water and placed it upon her head. Then he said to her, "I pray thee let me drink a little water from they pitcher;"-and she took it down and resting it on her hand, answered very pleasantly and kindly, "Drink, my lord." While he was drinking, she saw that he looked like a stranger, and that his camels seemed tired with the journey, and she was sorry from them. So she said, "I will draw water for the camels too;"- and she did draw enough for all the ten camels, though she must have been pretty tired when it was done, for these animals drink a great deal. From all these circumstances Eliezer felt sure that God had heard his prayer; and it gave him pleasure to think that if this young woman was willing to take so much trouble for a traveller whom she did not know, she would be a very kind and good wife.